Every now and then, the Coen brothers strike gold. No Country for Old Men, Oh Brother, Where Art Thou? The Big Lebowski, Fargo, and Raising Arizona come to mind. But sometimes, like the rest of us mortals, they just hit dirt. Not pay dirt, mind you, plain old dirt. 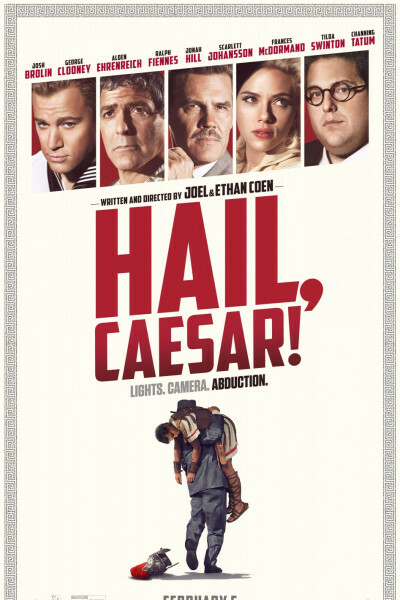 You may disagree, but I found Hail, Caesar! to be uninspired, flat, boring, and neither funny nor clever. I think the finest scenes are those presented in the trailer. It could be that Coen productions are a bit like Monty Python: you either get it and like it, or you don't. One man's trash is another man's treasure. That's fair; that's art, or whatever. Four or five moments made me giggle, but most made me groan. When it was over, there was just a long, awkward silence in the theater. One woman, several rows back was heard to say, "Well, that was cute." Another mumbled, "Interesting." That mitigated praise probably sums it up, I suppose: maybe cute, maybe interesting, maybe meh. As such, it's a pretty long hour and forty-six minutes, and this coming from a guy who loved seeing Reds in the theater, intermission and all.